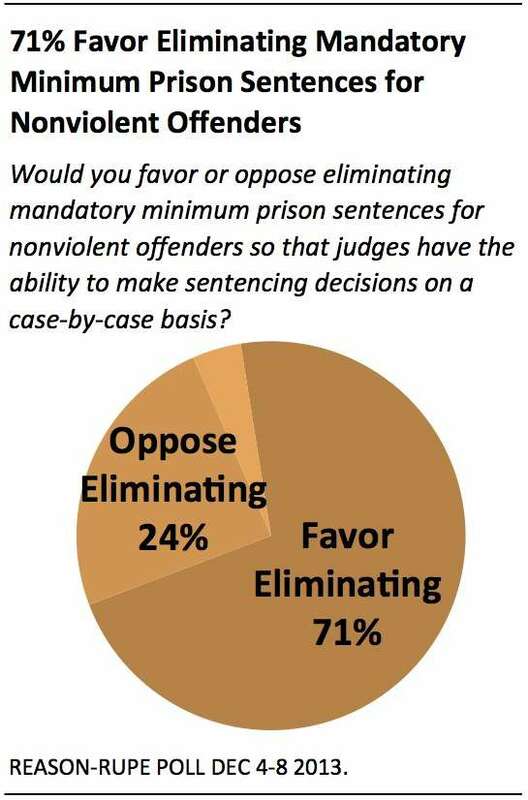 The latest Reason-Rupe poll finds that more than seven in 10 Americans, 71 percent, favor the elimination of mandatory minimum sentences for non-violent offenders so that judges can regain the ability to make sentencing decisions on a case-by-case basis. Less than a quarter of Americans, 24 percent, oppose the idea. Public opinion on this issue is consistent with the recommendation against mandatory minimum sentences issued by the independent organization Human Rights Watch, which reports that 97 percent of drug defendants, including first-time and low-level offenders, are strong-armed to plead guilty in exchange for a sentencing deal rather than exercise their right to a trial at the risk of receiving a significantly longer mandatory minimum sentence. Democrats are slightly more likely than Republicans to favor eliminating mandatory minimums but only by a margin of six points (74 percent to 68 percent). Seventy-two percent of independents agree. It's also important to keep in mind that most Americans are not fully aware of the arguments for and against mandatory minimums. Nevertheless, because Americans' initial reaction is to oppose mandatory minimums, the burden of proof lies with those who favor the status quo. Nationwide telephone poll conducted Dec 4-8 2013 interviewed 1011 adults on both mobile (506) and landline (505) phones, with a margin of error +/- 3.7%. Princeton Survey Research Associates International executed the nationwide Reason-Rupe survey. Columns may not add up to 100% due to rounding. Full poll results, detailed tables, and methodology found here. Sign up for notifications of new releases of the Reason-Rupe poll here. One hundred percent of prison unions want mandatory minimums to stay right where they are, so that’s what we’ll be doing. When asked, a seeming majority of Hit & Run posts polled admitted to being polls. Seems like that could work either way. “Tools” is more accurate. Take that, bitchezzzzz! If you hurt someone else it’s violence, if you don’t it’s not wrong. therefore eliminate non-violent offenses.